The EOS 20D is dead - long live the 30D! The EOS 30D is designed for keen photographers who've outgrown entry-level models like the EOS 350D or Nikon D50, but who don't quite have the budget for a professional digital SLR. More than a few professional photographers might be tempted, too, by the 30D's solid build quality and sophisticated photographic functions. Sports and action photographers will be very impressed by its ability to shoot at five frames per second, and for up to 30 shots at a time. So, what's actually different about this camera compared to the old 20D? The main changes are to the LCD, the metering system and the shutter mechanism. The LCD goes up in size from a 1.8-inch screen to a 2.5-inch display, and one with twice the number of pixels (230,000) to give a much sharper image during playback. The viewing angle has been increased too, so you can still see the display even when you're working at an angle to the camera, and it's easier to show groups of people your shots. The addition of spot metering is welcome and, indeed, overdue. The 20D offered multipattern evaluative metering, centre-weighted metering and partial metering. Partial metering is a Canon speciality - it takes a measurement from an area in the centre of the frame accounting for around 9 per cent of the whole scene. It's somewhere between centre-weighted and spot metering in its coverage. Whatever the arguments in its favour (principally that it's less error prone than tight 'spot' angles), there's no doubt that many photographers found it a bit of a half-measure. The third major change is altogether less obvious. The shutter mechanism now has a life-expectancy (or 'duty cycle' in manufacturer-speak) of 100,000 shots. The average amateur won't take a fraction of that in the camera's entire life (or their own, even), but a busy pro could easily rattle off 1,000 shots in a single assignment. In keeping with its more serious intentions, the 30D is altogether bigger and chunkier than the EOS 350D, its entry-level stablemate. As with other 'serious' SLRs, there are two control dials rather than one: the first on the front of the handgrip, another on the rear. This rear Quick Command Dial is used for menu navigation, exposure compensation and other settings. On top of the camera and just to the left of the shutter release are three buttons. Each button has two functions. You press down the button and then rotate either the front or the rear control wheels to change that setting. For example, the middle button adjusts the drive mode and ISO - you turn the front dial to switch between single shots, continuous shooting and the self-timer, and the rear dial to change the ISO setting. This is fine in principle since it cuts down on the number of external controls on the camera. But you make a lot of mistakes by choosing the wrong dial for the job, and while eventually you'll remember which dial does which job, it's not going to happen overnight. Otherwise, there's very little to complain about. The menu navigation's still odd, in that you don't have a conventional system of tabs for separating shooting, playback and set-up options, for example. Instead, these are all merged into one, long list, though each section is colour-coded. In practice, you can still get to the options you want quickly by 'spinning' that rear control dial or using the Jump button to jump between sections. The power switch is on the rear of the camera, right at the bottom. Because of the way the lever's recessed, it's a little difficult to switch off, but maybe that's deliberate. The power switch has a third setting beyond 'on', which activates the rear control dial's EV compensation function - to change the exposure value, just spin the wheel. Once you get used to it, the 30D's a slick and easy-to-use camera. You'll appreciate its relatively clean, uncluttered design and its strong construction. Your first batch of pictures, though, may dent this confidence a little. There's a softness about the fine detail that sends you scurrying off to the camera settings to make sure you've got the sharpening enabled. But no, all's as it should be. It just seems that the standard output is just that little bit soft. You can sharpen shots up later in your image editor, but it would be better still if you didn't have to. Shooting RAW makes little difference, and if you hike the sharpness settings too high in the supplied Digital Photo Pro conversion software, you start to get CCD artefacts and rogue edge pixels round high contrast edges. In other respects, however, the image quality is excellent. The evaluative metering produces consistently good exposures, and the results aren't too contrasty - there are fewer 'blown' highlights with this camera than we've seen with other EOS models. The colour rendition's especially good, but will you really have the patience to experiment with Canon's Picture Styles? Given that these are all independently customisable, and that it's not immediately clear how they dovetail with the camera's scene modes, it all gets a bit confusing. Ultimately, the pictures produced by the 30D aren't really very different to those produced by the 20D, so that while the camera itself is undoubtedly better specified, you have to wonder whether Canon's done enough in a market which has seen some big changes. And one of the biggest has been the launch of Nikon's D200. 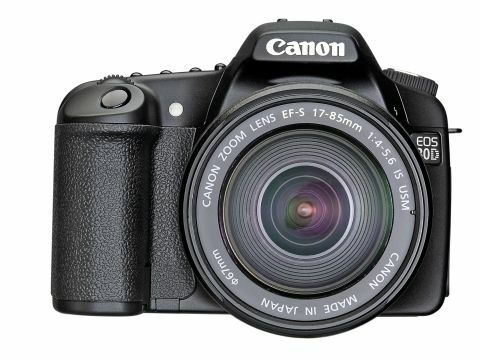 This has a higher resolution sensor, which, in our tests produces sharper shots, and it's also a very well-made camera. The 30D's a modest step up from the 20D, but the competition has come on in leaps and bounds.